As has been reported, we've just signed a deal to sell our startup Socialize to ShareThis. Although having a successful exit is a dream for many entrepreneurs, I find myself feeling a wide range of emotions and thoughts. I'd like to share some of them in this blog to provide an honest assessment of what it's like to work tirelessly on a startup and then sell it. Investors Mitch Kapor of Kapor Enterprises, George Zachary from Charles River Ventures, Turner Broadcasting's MediaCamp (applications for next year's class are now open! ), Ben Narasin ofTriplePoint Capital, Chris & Peter of Transmedia Capital, Igor and team of TMT Investments, Anis Uzzaman of Fenox Venture Capital, and Jeremie Berrebi from Kima Ventures (the most active angel investor in the world). Likewise, Andre, Gaurav and Andy at SiliconLegal are the types of attorneys entrepreneurs usually only dream of. Their boutique firm’s tagline is “Entrepreneurial Legal Counsel,” and they totally get it. SiliconLegal handles an overrepresented amount of deal flow in the valley for its size, yet its rates are startup-friendly. Pairing Ezra with Gaurav at SiliconLegal was like having a secret weapon. And a huge thank-you to Kristen Goldstein at Backops, our back-office team, for insisting I meet Andre at SiliconLegal initially, and to her team for expertly handling all of the parts of a startup that the entrepreneur typically neglects: Accounting, HR, and finance. If you're not familiar with Backops' model, I recommend connecting with them. Backops is like a timeshare for back-office talent: You share slices of time of competent professionals with other entrepreneurs that would typically be inaccessible to you due to cost. Having your startup house in order before deal time will save you major headaches down the road. I'd also like to recognize my co-founders Sean and Isaac. It's hard to put into words how treacherous a startup is in the early stages: You have to find people that you can work with. Then you need to have complementary skillsets that create value and don't cause conflict within the team that would cause it to break apart. While some conflict is healthy, founders need to be able to get along with each other for extended periods of time (years, not months) under the most stressful circumstances imaginable, all while testing the market with crazy ideas that nobody else believes in (because if they did, they'd be doing it themselves). Not only were Sean, Isaac and I lucky enough to find each other initially, but we were able to navigate these waters together and become very close friends in the process. And that's incredible. The Socialize team has changed a lot over the past four years. Originally we were called PointAbout (which we sold in 2011 when we decided to move out West). PointAbout was based in Washington DC, making mobile apps for large brands like The Washington Post, Cars.com, Newsweek and Disney. There were many people involved back then that have gone on to do other great things in the startup ecosystem, and their involvement back then built the foundation of our business today. So thank you to all of you -- you know who you are. When we moved to CA originally, it was due to the success of our first product, AppMakr. And there was an entirely different group of people involved in that endeavor. Again, thank you for helping us build the foundation that became Socialize. You should be very proud of your work. 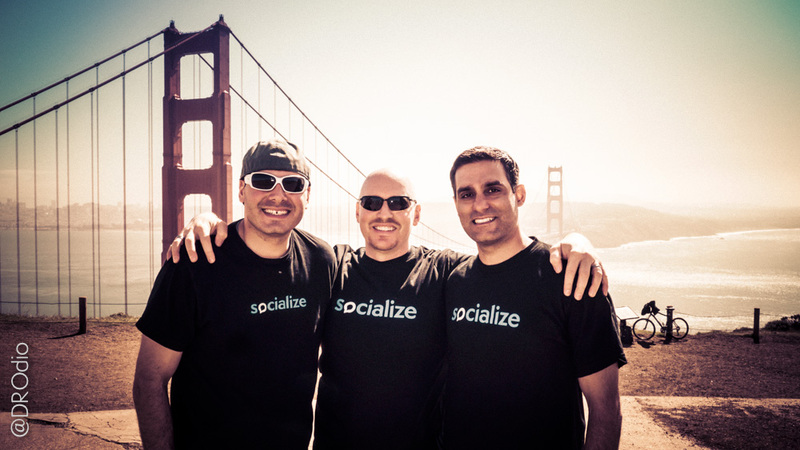 And a huge thank-you to the rest of the Socialize team-- Jason, Nate and Nick-- for your hard work and dedication to help us achieve some incredible milestones: Just over 1 year after we launched Socialize, it's been implemented by over 900 apps with over 67 million end users. It's easy to lose track day-to-day of how much we've done, but take a step back to take a look at it and appreciate what you've helped create. But most importantly, I'd like to thank the spouses, family and friends of everyone involved in the deal. We literally could not have done this without your support. It's impossible to overstate the level of sacrifice you have made for us. Being an entrepreneur is often romanticized -- especially by those that have yet to try it. The reality is that it's an incredible, gruesome grind. It's an emotional roller coaster of epic proportions. Some days we've felt that we were unstoppable and could conquer the world. Other days, we've wondered why anyone would ever believe in us. And our spouses, family, and friends have been at our sides the entire time. Some examples of how they’ve supported us (that they will likely remember well) include: Founders & employees not arriving home when they said they would... being woken up with to frantic calls in the middle of the night due to a server that was down or other emergency... us not focusing on whatever they were saying because of some inexorable problem we're trying to solve in our heads... us absentmindedly leaving lights on, pans on the stove, and all sorts of other things that even the most mildly aware person would be capable of handling... all of this, for years on end. No seriously, for years. To say they’ve been patient with us is such an understatement that I cringe even writing it. Thank you spouses, family, and friends, for your never-ending support as we've pursued this crazy dream of ours. The first and most palpable feeling is one of opportunity. The entire reason we're selling Socialize to ShareThis is because we believe that we can accomplish more, faster, and create more value this way than we can via any other available option. And so I'm really excited to start that journey. I'm looking forward to meeting the people at ShareThis that I haven't yet met. I'm anxious to prove that our thesis is correct. I already see opportunities in front of us that weren't there before we joined forces. The second feeling is one of sadness, and loss. When you work on something for four years, it becomes a deep part of your identity. I'd imagine that selling a company feels a lot like a parent sending their child off to college. I hope that I've done everything I can to ensure its success as a part of a larger entity. I believe every entrepreneur has this feeling when they sell, and I wish it wasn't so taboo to talk about it publicly. I appreciate that ShareThis was OK with me expressing these feelings in a public way to start that conversation. I've made it a personal mission to ensure that this acquisition lives up to its promise. One of the ways I've been doing this is by interviewing other entrepreneurs that have sold their companies to look for best-practices and trends around what elements make an acquisition succeed or fail. I'll write more on this topic in the future as I implement the things I believe are key to ensuring a successful outcome. I'm also planning on writing a blog in the future that dissects our company's path in greater detail, and highlights what I believe we did well along with the constructive lessons we learned along the way. I'd also like to know what questions you have around the acquisition, and what the experience is like. Just ask me in the comments below and I'll do my best to answer any questions. And to pre-empt “the question”: No, I can't talk about the sale price or any of the deal terms. As is almost always the case, they are confidential to the parties involved. Let's just say that while the founders can't go buy their own private islands just yet, it was a very meaningful outcome for the hard work we put into the company over four years. Here are some fun pictures of Isaac, me and Sean ripping open our Socialize shirts to show off the ShareThis shirts underneath. You can find a full gallery of the photo shoot here.